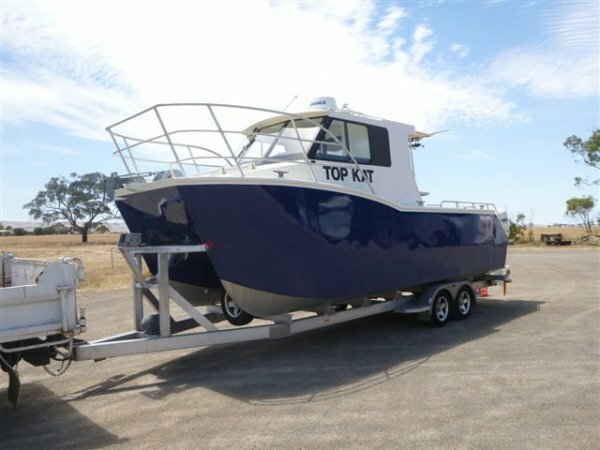 Launched 2010.2 x 150Hp Evinrude E-Tech approx 100hrs giving Economical 22Kt Cruise. 400L Fuel, 60L Fresh Water. Flushing Toilet off rear deck. Lawrence HDS-8 x 2 Radar/Sounder/Plotter. Simrad Auto-Pilot. Excellent Aluminium Trailer. Current 2C 4+1. Stress Relief Anchor Winch. As New Charter/Fishing Cat "Ready to go" at significantly less than replacement. Asking Price: $145,000 + gst neg - Significantly Reduced!